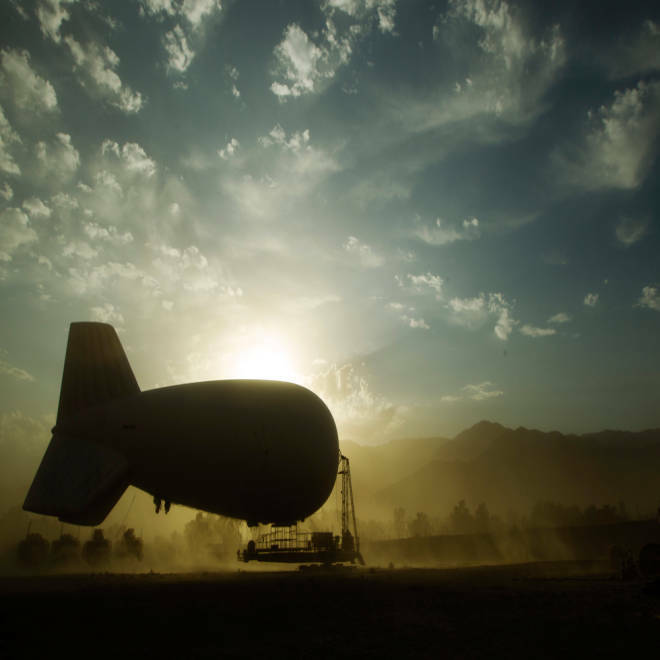 A sandstorm blows past an inflatable blimp inside Forward Operating Base Joyce in Afghanistan's Kunar Province in June. Dozens of surveillance blimps now being used on the battlefield in Afghanistan and Iraq could be deployed on the border with Mexico under a new joint initiative by the American military and border patrol officials, the Wall Street Journal reported. If tests overseen by the military over the next few weeks are successful, the Department of Homeland Security would deploy 72-foot-long, unmanned surveillance blimps to help trace drug traffickers and those trying to enter the United States illegally, the newspaper reported on Tuesday. The helium-filled drones have drifted over military bases throughout Afghanistan and Iraq for years, the Wall Street Journal reported. Often floating some 2,000-feet above above ground, they are equipped with cameras, infrared sensors and other hardware to help keep an eye on militants, insurgents and troops in battle, according to the newspaper. With bases in Afghanistan shutting down, the aircraft are part of an enormous trove of military equipment set to leave the country over the next two years, the Wall Street Journal reported. Heavily armed boats from Texas are now patrolling the U.S.-Mexico border along the Rio Grande. NBC's Charles Hadlock reports. If the tests go well, the military could give Homeland Security dozens of blimps and surplus equipment worth $27 million, the newspaper reported. Border officials are already using military hardware along the border with Mexico, such as unarmed Predator drones, the Wall Street Journal said. The surveillance drones were being offered free of charge, Mark Borkowski, assistant commissioner at the U.S. Customs and Border Protection Office of Technology Innovation and Acquisition, told the paper.